Markets recovered surprisingly well last week, but despite this recovery the lunar red period ended with a slight loss on the Nasdaq. We now enter a new green period, what’s in store? This looks like a potential double top. 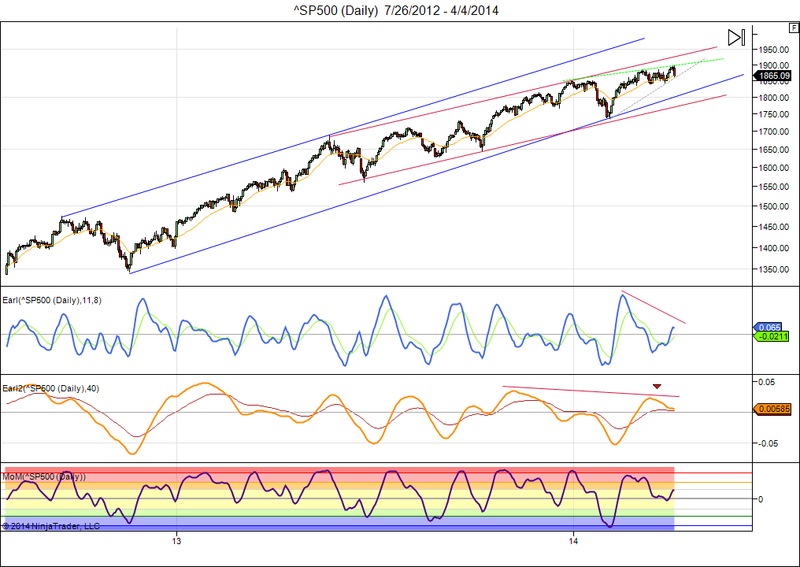 We cannot rule out a further rise to 3400, especially in an eclipse green period as discussed last week. But my Earl indicator is in peak territory already, which is a warning sign that another leg down can start any moment. The Earl2 is still not showing a buy signal either. The LT wave has continued to do well, and it is also showing weak for May, especially for the second half of the month. This means we have mixed signals, and even though a potential rise to 3400 is in the cards, the odds for a serious move into the other directions are not small either. It is decision time for this market: either the resistance at 3300 gets broken convincingly, or we get a sizable drop to the 3000-3100 range. Because the picture is so mixed I will just watch from the sidelines this week. I just don’t see a good risk/reward ratio in either direction at this point. This market starts reminding me of the 1993-1994 period. Most investors were not overly optimistic even though the market was setting all time highs. And everybody was waiting for a much needed correction. But the stocks just kept grinding higher with only some small pullbacks of 3-5%, and then in 1995 they started going up even faster. Those who were betting on a correction just lost money month after month. Hopefully we will get more clarity by next week. 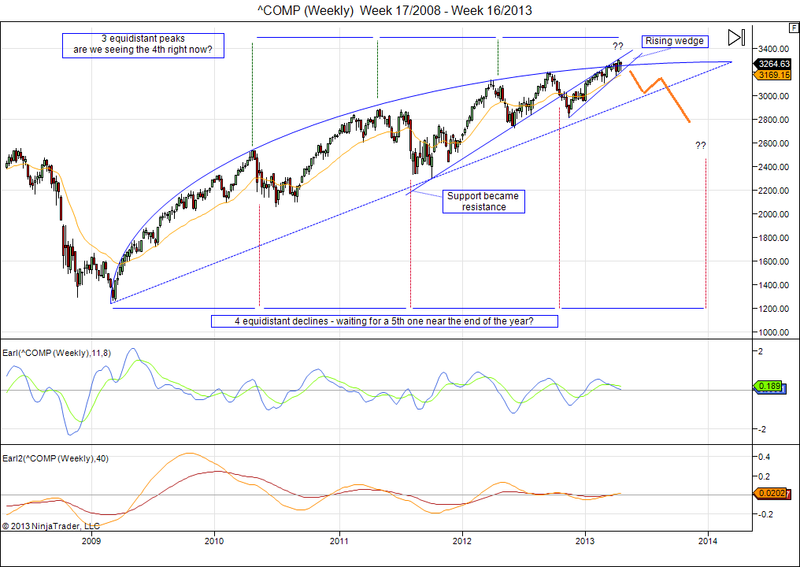 This is an update to the long term outlook we presented in February. 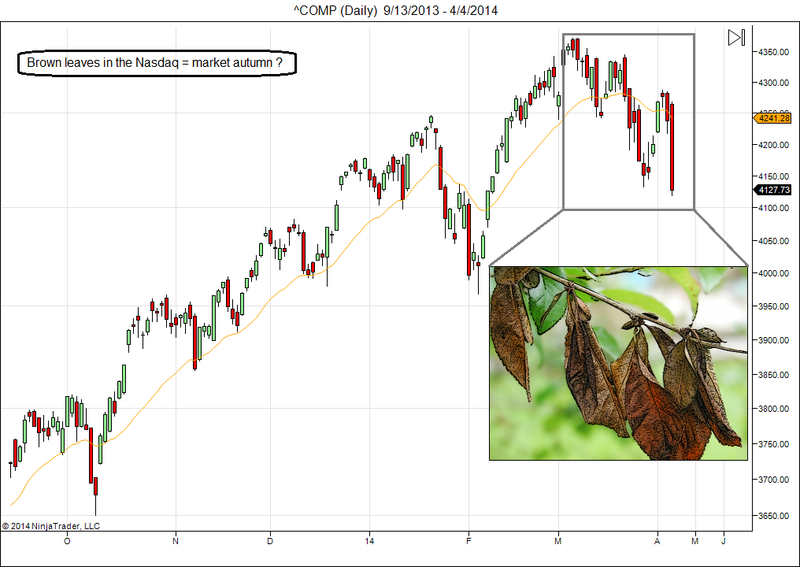 We pointed out that the 3200-3300 level on the Nasdaq was going to be a tough resistance zone. And indeed, the market has now spent several months trying to overcome that level, and failing so far, with the Nasdaq currently sitting at 3264. So, for all the talk about an unstoppable bull market, the Nasdaq is only 50 points higher than it was in mid February. We can see that the large arc formation remains in play. Notice how we have had four equidistant declines/bottoms within this arc formation, which may call for another bottom by the end of 2013. Also notice how we got three equidistant peaks, which point to a possible fourth peak right now. If this pattern holds up, then look for an initial decline towards 3000 support level. Then a rebound, followed by another leg down in autumn or winter of this year. The scenario is drawn in thick orange on the chart. Only a clear breakout to the upside, which becomes evident when the Nasdaq climbs to 3350 or 3400, would move this scenario off the table. So, I have sold most of my stocks by now, only keeping some core holdings. 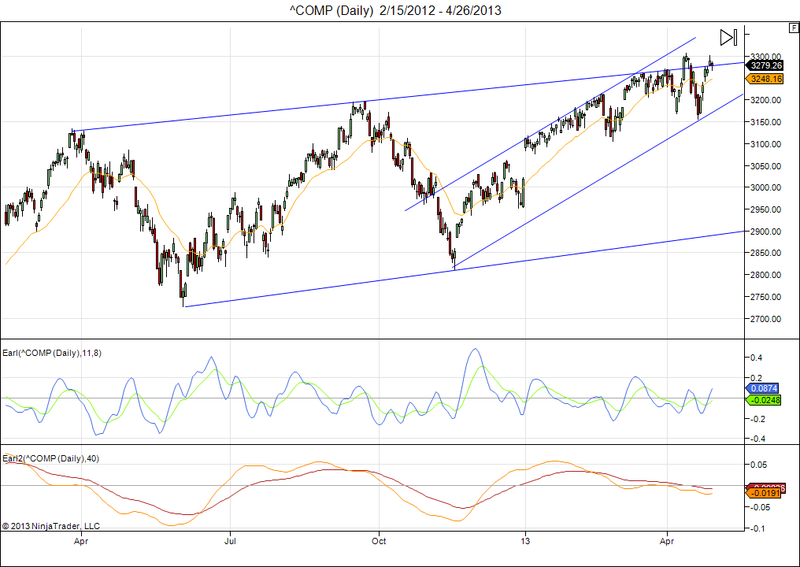 If I am wrong then I can buy back when Nasdaq reaches 3400, and will have given up a potential 5% of my profits. If this analysis pans out, then I will be able to buy back my stocks 10-20% cheaper somewhere down the road. That’s what I call a good “no-risk/reward ratio”. At major crossroads like this, markets trying to overcome resistance levels, I prefer to let other investors do the heavy lifting and I try to pick up the somewhat “easier” profits that come in between.